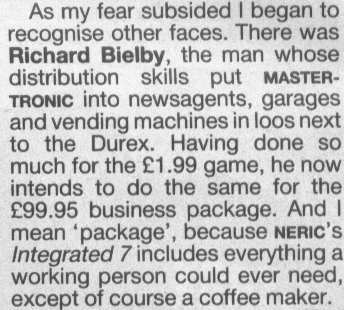 A very rare mention of Richard Bielby, the man who organised the teams of distributors in Mastertronic's early years. As our distribution channels grew we sold directly to the high street stores and the main wholesalers, and also directly to some of Richard's own customers, effectively cutting him out of the market. I don't think this was done in a nasty way - both sides recognised that the growth in the business had rendered the old ways obsolete. This appeared in John Minson's column in Crash, April 1987 describing a visit to the Which Computer Show at the NEC, Birmingham.